Using predefined signals like this has many advantages, one of them is that it decreases levels of freedom and allows you to specify conditions that make some real sense in trading. SQ will then use these predefined conditions instead of trying to generate the whole condition randomly. Like indicator, signal is a snippet that must be programmed in SQ. 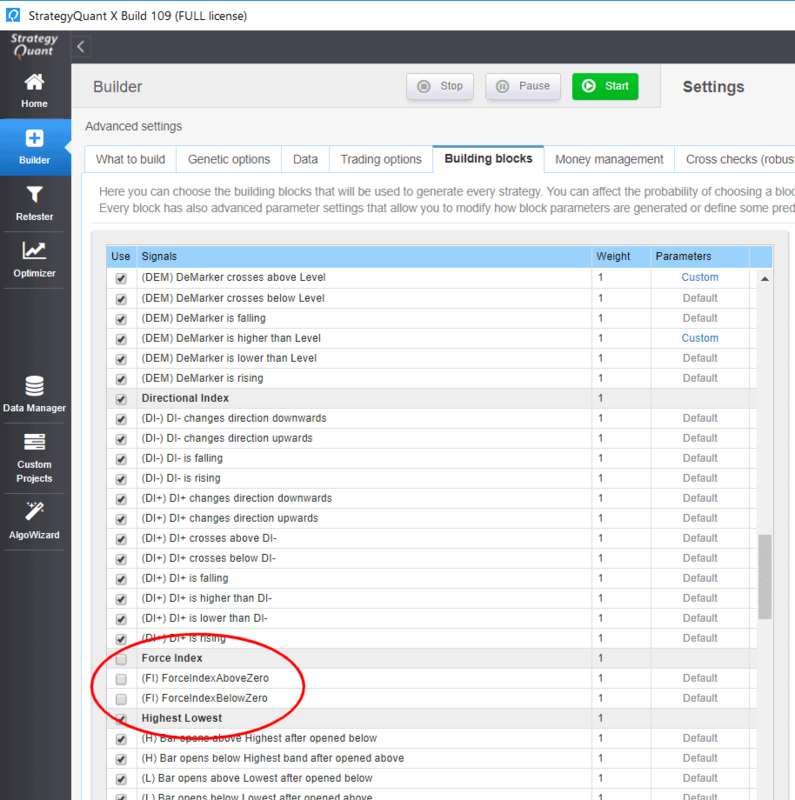 Open CodeEditor, click on Create new and create a new snippet with name ForceIndexAboveZero. Choose Signal as snippet type, and ForceIndex as indicator the signal is based on. This will create a new snippet ForceIndexAboveZero.java and places it into SQ -> Blocks -> Indicators -> FoceIndex folder. When we’ll review the code you can notice the code is much simpler than the code for the indicator itself. It also has parameters, which should match parameters of indicator, and then only one method OnBlockEvaluate() which should return true or false depending on if the signal is valid or false. Please note that the standard signals template might not match your indicator, as it is in this case. If you’d try to compile it you’ll receive compilation errors, because the call of the indicator Strategy.Indicators.ForceIndex(Input, Period) in OnBlockEvaluate() method doesn’t use all the required parameters. If you’ll look at the ForceIndex indicator you’ll notice it has parameters: Chart, Period, MAMethod, AppliedPrice. or alternatively you might want to omit some of the parameters, and use its fixed value instead. Creating a parameter means that it will be editable in Wizard and SQ will be able to generate random values for this parameter. In contrast with indicator snippet, Shift parameter in signals is not used by default and has to be explicitly added. Below is an implementation of OnBlockEvaluate() method for our signal. 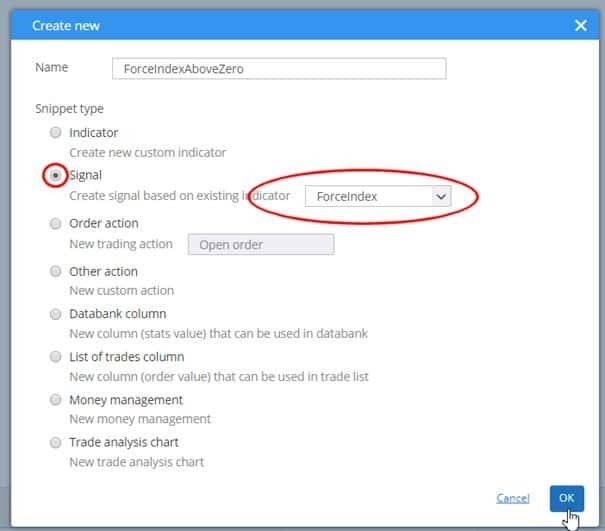 As you can see, it is quite simple – you only have to get the indicator by calling Strategy.Indicator.ForceIndex(…) with proper parameters, and then just get its value at specified Shift and compare it with zero. This is all, our new signal is now finished, we can click on Compile and it should be successfully compiled.